For those of you who are familiar with my writing here on Exotheology.org and in my book Stranger and Aliens, you are probably aware that I knew I probably wouldn’t like the Alien Intrusion film going into it. It was already evident from the trailers and, frankly, the Alien Intrusion book itself that this movie was going to espouse the Demonic Hypothesis of UFO. And let’s just say from the outset that if you’ve read the book, you’ve seen the movie and vice versa. I freely admit this, especially because Alien Intrusion: Unmasking A Deception is, perhaps inadvertently, a study in how our pre-existing biases color our view of ufology. The documentary style film begins by relating the October 30, 1938 War of the Worlds radio scare where in Orson Welles’ Mercury Theater company put on a convincingly realistic radio dramatization of H.G. Well’s classic novel of Martian invasion, The War of the Worlds (1897) and, according to legend, sent the nation into a panic. Using this hook, the film predictably launches into an argument that the idea of extraterrestrial life is founded in science fiction. Which means that the movie, like the book it was based on, really didn’t dig too deep into what Christians have historically believed on the subject of extraterrestrials. For the record, Christians have been discussing what’s called exotheology long before Darwin or science fiction even came along. Which means that the idea that the idea of extraterrestrial life isn’t founded in science fiction. This is such a silly error to make right off the bat, but the film does follow the script of the book. Instead of bothering to research the history of Christian exotheology and ufology, the filmmakers stuck with Gary Bates’ strategy of relying on the Satanic Panic-inspired body of Christian ufology that came about during the 1970s. None of those books seemed to have a sense of history either. And, no, the Demonic Hypothesis isn’t new. It’s been around since Christians first encountered the contactee movement in Truman Bethurum in 1954. That wasn’t condescending at all. From there, the film argues that, as a matter of science fact versus science fiction, extraterrestrial visitation is impossible because our present knowledge of physics pretty much makes faster-than-light travel, more or less, impossible. It would go on to assure us that it will remain impossible in the future, because physics, ruling out the Extraterrestrial Hypothesis. As a science fiction author, I readily admit that the tyranny of distance is the bane of my craft. Warp drive. Worm holes. Generation starships. Cryosleep. We come up with all sorts of stuff to figure out ways around the problem of getting aliens to Earth or humans into space. Alien Intrusion is cynical about our prospects of overcoming the problems. I’ve pointed out that there are people who are working on these problems and that it would be more scientific (and less dogmatic) to say that space travel to a galaxy far, far away is currently impossible. That comment got me banned from making further comments on Creation Ministries International’s Facebook page (but I did save a screenshot of it for posterity’s sake). Being a creationist film, there was an obligate aside into refuting the Big Bang theory and abiogenesis, followed by a brief look at undirected and directed panspermia. You know, the idea that life came from space, either accidentally or on purpose. At this point, there is a little animated scene with a Grey dumping a vial of fluid in a pond to start life. The entire scene is weirdly similar to that gross scene in Prometheus when the alien Architect sacrifices himself to give life to a planet that is presumably Earth. In this section, Dr. Jonathan Sarfati makes the surprising claim that the Big Bang Theory is necessary for a belief in the possibility of extraterrestrial life. Just like the bit with evolution in general, it ignores the history of church discussion on this subject of the possibility of extraterrestrial life and pretend as if the whole thing started with either Darwin’s theory, or science fiction itself. For those of you who are interested, we’ve been discussing the theological implications of extraterrestrial life since at least the Middle Ages. And, yes, the filmmakers managed to find an opportunity to put in that awful sign about people not even believing in aliens if it weren’t for evolution. Again, a belief in evolution is not intrinsic to a belief in the possibility of extraterrestrial life. One can simply believe that God may have made other beings throughout the universe because that would be consistent with the revealed character of a Creator who made microbes, nebulae and galaxies far in advance of humanity’s ability to see and appreciate them with microscopes and telescopes. Viewers will likely find the section on the Roswell crash dissatisfying if they’re expecting more than pat answers. We are told that we might not want to hear it, but it’s that simple. This was disappointing because the book actually goes into much more detail and shows a much better grasp of the complexity of the investigating of the alleged crash. Despite such mundane explanations for one of the enduring mysteries of ufology, the film then goes on to suggest, as the book did, that the UFOs themselves act in a manner that defies physics and therefore must not be physical craft, ruling out the Terrestrial Hypothesis. Inevitably, there comes the obligate citing of secular experts who adhere to the Extra-dimensional hypothesis of UFO, as if all experts had converted to this theory, even though the Extra-Terrestrial Hypothesis of UFO is still dominates the field. There would be no discussion of the Psychosocial Hypothesis of UFO or any other theory. There is a point about 45 minutes into the film where Gary Bates inadvertently stumbles his way into the Psychosocial Hypothesis of UFO. He comes so close! He notes that when people have seen these UFOs throughout the ages we tend to filter it through our old pre-existing biases. The Roman saw shields with people on them. Folk in the late 1800’s saw advanced airships. And we see spaceships from another planet with interiors that reflect our ideas of what high-tech should be. In the 1950s and 1960s, that amounted to a bunch of knobs and switches. Now folks who have experiences see instrumentation that Tony Stark might’ve invented. And that’s because our idea of what high-tech has changed. We filter these things our cultural lens. When we see things in the sky we can’t quite identify our minds fill in the details according to our preconceptions, into something that makes sense, into something that fits in the world we live in. I said that this is a film about how pre-existing biases color our view of ufology. The bias of Gary Bates towards the Extraterrestrial Hypothesis is made evident in a scene that, perhaps, shows us more than it intended. Bates points to a sign in Roswell, New Mexico and says that he hasn’t seen this one before. He goes on to describe it as obviously a rendition the Sistine Chapel painting of God creating man. Then he says that this billboard illustration really shows you how far things come or something along those lines because you couldn’t get away with this 20 years ago. The problem is is there was a similar scene even further back than that. 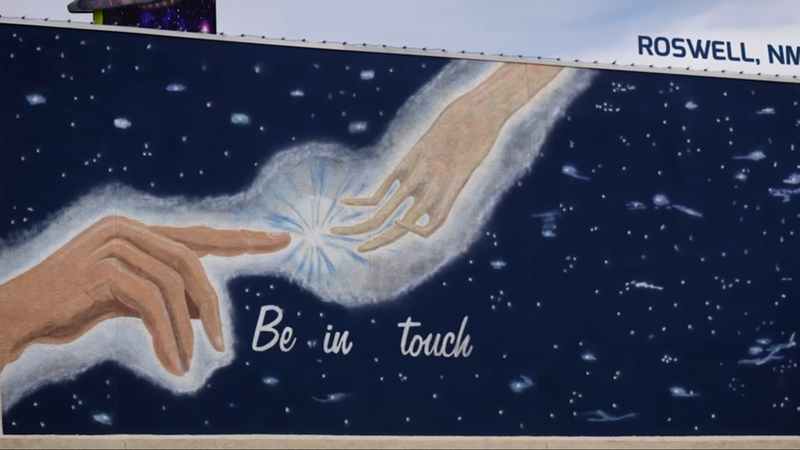 You see, the billboard in question only shows an alien hand touching a human hand with the message, “Be in touch.” There is no angelic host. No figures of any sort. We only see two hands, one of which is clearly alien. And we saw a similar scene to that when ET the Extra-Terrestrial touched Elliot’s hand in Steven Spielberg and movie in the 1982 movie. Bates interpreted the billboard to be the creation account because he’s a creationist. That is the lens through which he saw that particular display. And that lens also comes with an additional spooky green anti-alien filter. Meanwhile, nowhere on the billboard is there any indication that this is supposed to be a creation account or that it’s a parody of the Sistine Chapel. It is quite literally one hand touching another and could just as easily be a homage to that scene in ET: The Extraterrestrial. Anyway, through selective quotations of experts, particularly of John Keel and Jacques Vallee, the Extra-dimensional Hypothesis is then equated with being a sort of secular version of the Demonic Hypothesis. At no point are we told that the majority of experts have not converted to the Extra-Dimensional or Inter-Dimensional Hypothesis. In fact, no one mentions that many ufologists discount the experiencer movement entirely, but we’ll get to that. I will say that the quality of the film was really good was at least as good as the Ancient Aliens series. The movie drags on but no more than other documentaries of this nature do. The special effects were really good, but oddly some of the best were saved for the end credits. I think that if the documentary had been more self-aware and less preachy, it could have been a little more entertaining and much more effective. To be honest, it started dragging somewhere in the Second Act to the point I found myself starting to doze off. In the Third Act, we are told (repeatedly) that, despite the fact that these alleged space aliens are inter-dimensional and perhaps even supernatural beings therefore negating the possibility of scientific testing, we can nonetheless test the very nature of the UFO phenomenon through the experiencers, also known as contactees and abductees. We are then told of the traumatic nature of abduction experiences and that selective quotations from experts who espouse the Inter-dimensional Hypothesis show that even secular ufologists suppose that these so-called aliens are just the demons and fairies of bygone days with a technological varnish. We are told that experiencers “receive” New Age teachings that are counter to Christianity (with the value-added bonus of Bates responding to a quote from a 1970s Satanic Panic-influenced Christian ufology book by feigning surprise and saying “They nailed it”), implying that these message of Greys and Space Brothers are specifically hostile to Christianity because they are really and quite literally the doctrines of devils. Nowhere is it mentioned that the Space Brother tales were patterned off the tales and teachings of the first contactee, George Adamski. Adamski’s space voyages have been proven to be retellings of his earlier science science fiction stories. Likewise, the Venusian Theosophical teachings (which Christians recognize generically as New Age cult philosophy) of Orthon are lifted from his earlier book, Wisdom of the Masters of the Far East (1938). Research has shown that those who are familiar with New Age teachings and are familiar with UFO lore are more likely to be “abducted,” which makes the similarity of the recurring pattern of the abduction narrative easily explainable under the Psychosocial Hypothesis. The lynchpin of the film’s argument for the Demonic Hypothesis is Joe Jordan and CE4 Research’s claim to have discovered that so-called alien abductions can be stopped in the name of Jesus Christ. I was frankly a bit disturbed by parts of this section. I understand that they were trying to give hope the people who think that they are having these alleged alien abduction experiences. The film correctly points out that these people are suffering and that many of them experience symptoms of PTSD as a result of the experience. And the filmmakers are most certainly correct in stating that the name of Jesus can deliver them. The name of Jesus has authority over all things, be they demons, nightmares, or visions associated with sleep paralysis. Joe Jordan made his distinction between talk the talk Christians and walk the walk Christians, because some abductions of Christians DON’T stop at the name of Jesus. So Jordan is basically saying that it’s a matter of whether a person is a real and/or dedicated Christian. (And the book does state that some talk the talk Christians “might not be truly ‘born again,’ and therefore not truly Christian.”) It’s an assertion he’s provided no data for. I suppose that it would be hard to provide data for something that subjective, but to be fair he’s making the assessment somehow… even though only God knows the heart, right? And then it happened. Gary Bates is interviewing him, asking him to tell him what he’s said to him before, off-camera at some point. And Joe says there’s no other name he has found that will stop alien abductions permanently. Now we DO know that the name of Jesus isn’t the only way to stop an alien abduction: will power and resistance will do it. And that makes me suspicious of this whole Talk The Talk/Walk The Walk dichotomy that they invoke. Why does the name of Jesus only work for real Christians who are living it right when an unbeliever can stop an abduction experience with willpower? It seems that the phrasing of the statement is meant to answer in a way that leads the audience to a certain conclusion, namely that there’s no other means by which alien abductions can be stopped, which is simply not true. If that weren’t heavy-handed enough, there is actually a point in the film where Gary Bates suggests that being open to a belief in the possibility of extraterrestrial life could be enough to open a door for an abduction event. And since he believes that the abduction experiences are actually demonic in nature, he’s basically saying that if you entertain the possibility of extraterrestrial life you are also opening the door for demonic activity in your life. I’m pretty sure most people would agree with me when I say that that is stretching things a bit too much. This is overstatement at its worst, a scare tactic to prevent folks from questioning the anti-alien dogma they’re presenting. The movie doesn’t seem to know how to end. The last 10 to 15 minutes are just cringe-worthy with how repetitious it becomes. It almost seems like they’re just repeating the last half of their first trailer for the film in that space in a never-ending loop. It’s just bad. There’s a lot of fast and loose quotation of scripture that we hadn’t really seen to this point. It was obvious that they were trying to shoehorn some sort of Gospel message into this conclusion of theirs but it ended somewhat garbled and mixed in with their message of deliverance from alien abduction. So much so that it seems like there main takeaway was that Jesus came to save you from fake alien abduction. I can’t help but think that they could’ve done much better if they’d edited it down for a few more months. If you stay past the decidedly brief credits (and you will because the special effects are really cool), you can watch a panel discussion between Robert Carter, Joe Jordan and Gary Bates that adds nothing to the movie itself, except to stress that our current knowledge of physics makes faster-than-light travel pretty much impossible, that in the Inter-dimensional Hypothesis even secular researchers are coming up with a secular version of the Demonic Hypothesis, and a special request to go to AlienIntrusion.com and share your experience or story if you have one. I cringed at the latter request because it smacks of mining for material for a new book or movie. All in all, Alien Intrusion: Unmasking the Deception was, well, predictable. If you read the book, you’ve seen the movie and vice versa. The film is undeniably a propaganda piece for the Demonic Hypothesis of UFO. It will convince people who want pat answers from Christian experts on a decidedly weird subject they would prefer remain far from the stained-glass glow of their pews. It will reassure Christians who stopped researching after the Christian ufologists of the 1970s connected the subject, for better or for worse, with the Satanic Panic. Having said that, I sincerely hope that some of these experiencers find deliverance through the name of Jesus. It doesn’t have to be demons for Jesus to save you from it. If you’ve read the book, the film version of Gary Bates’ Alien Intrusion won’t hold many surprises for you. Yet, perhaps inadvertently, the film ends up being a study in how our pre-existing biases color our view of ufology.